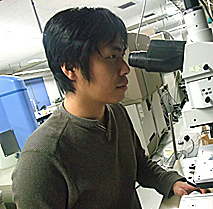 Assistant Professor Naoyuki Katayama and his coworkers at the Graduate School of Engineering, Nagoya University, developed a new 112-type iron-based superconductor that has a lower rare-earth metal content than other superconductors. Their paper was published online in the Journal of the Physical Society of Japan on November 6, 2013. Superconductivity is a phenomenon in which a substance loses electrical resistance below a certain temperature. Because of this property, superconductors have attracted broad attention as materials that can reduce energy loss during electronic transmission. However, the transition temperature is exceptionally low (approximately absolute zero: ?273.14 °C) and this temperature varies for each superconductor. In order to cool superconductors, an enormous amount of energy is required; therefore, the practical use of superconductors is difficult to realize even though they have a high potential for the improvement of materials employed in various electronic devices. In 2008, a 1111-type iron-based superconductor was developed in Japan with a transition temperature of ?217 °C. Because iron-based components are easy to manufacture, the superconductor was expected to have a scope for practical use, but the 1111-type also contained 25% rare earth metals, which add to the cost and resource constraints. Therefore, the development of a new superconductor that can be reasonably and sustainably manufactured is desired. 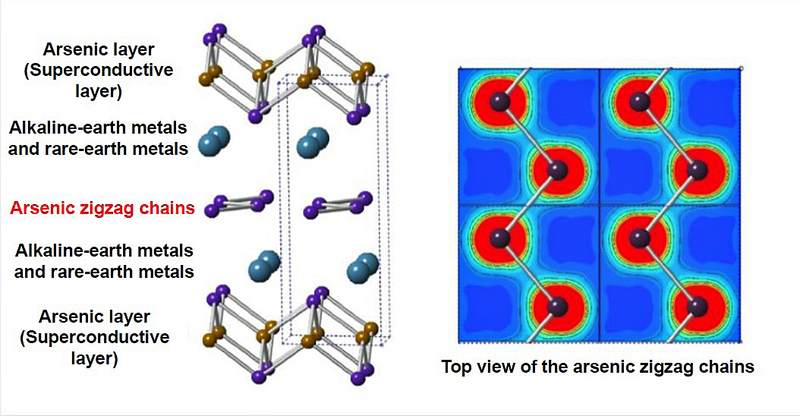 Prof. Katayama was determined to solve this problem and focused on arsenic, a constituent of iron-based superconductors. Previously, rare-earth metals were used as a glue to bind the superconductive arsenic layers in iron-based superconductive materials. He devised a new way to replace these rare-earth metals with arsenic and developed a zigzag arsenic chain structure to bind those layers. As a result, he succeeded in developing a novel 112-type iron-based superconductor that reduced the rare-earth metal content from 25% to 2.5-5%, and which comprised a smaller number of constituents. The new superconductor has a transition temperature of ?239 °C and some samples showed a temperature of ?228 °C, which is higher than the transmission temperature of superconductors in current practical use (e.g. MgB2: ?234 °C). It is widely expected that the aforementioned advantages of the 112-type iron-based superconductor over those in use at present will allow its practical use. Prof. Katayama has engaged in research on the various physical properties of electrons in a solid, such as superconductivity and magnetism. He has a special fondness for superconductivity as it led him to a career in scientific research. During his master's research, he was very determined to find a unique crystal that demonstrated superconductivity when water was poured over it. Currently, he observes electrons using x-ray diffraction to elucidate the mechanism for the expression of those physical properties. 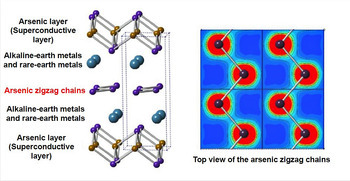 "It is necessary to increase the transmission temperature of the 112-type superconductor to make it a viable material. The arsenic chain I produced as an alternative to rare-earth metal has a flexible structure. It can be constructed in a form similar to the crankshaft in a car, as well as in a zigzag chain form. I would like to further improve the properties of this material and put a superconductive material made in Japan into practical use through matching various parameters such as shapes of the arsenic chain and types of elements used." "Research involves creative work to find something new. First, try to find what interests you and devote yourself to it. I hope you will actively research with enthusiasm, and discover new phenomena and properties that no one has ever seen."